On the night of October 10, 2011, our Wildlife Rapid Rescue Team received a tip from an informant about an illegal python skin factory in the Khan Daun district in Phnom Penh. The next morning, the team headed directly to Phnom Penh Court to obtain a search warrant. By 10am, warrant in hand, and working in conjunction with local military police and Forestry Administration officials, WRRT raided the factory and discovered 27 live pythons, weighing in at 248 kg, 180 kg of python fat, 74 kg of python meat, and 14 pieces of dry python skin. Products such as these can fetch a high price on the black market and are sold worldwide for food, medicine, and apparel. After the offender was apprehended, he was fined 40 million riels (equivalent to about $10,000 USD) but lacking the requisite funds, he was immediately sent to court. That afternoon, all the fat, meat, and skin was buried at Phnom Tamao Wildlife Rescue Center. 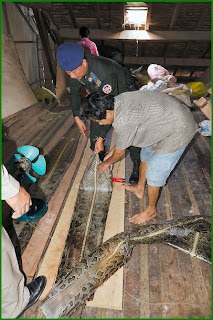 The next day, October 12, a team led by Mr. Heng Kimchhay, left Phnom Penh early in the morning to meet with Chief Forestry Administration official Heng Sieng Hong and our SWEC patrol team to release the 27 live pythons back into the jungle. The release took place about 12km from Andong Teuk village at 6 different locations along 300m of highway, not far from a stream to which they could return.